Background: Chronic obstructive pulmonary disease (COPD) and pulmonary arterial hypertension (PAH) are common and underdiagnosed medical conditions in India. Prevalence of these chronic diseases is high both in rural and urban areas. 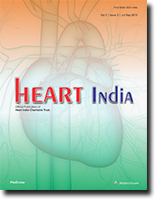 However, the exact prevalence of PAH in Indian COPD patients is unclear. Comorbid conditions like PAH have a great impact on the outcome of COPD in the form of severity, exacerbations, morbidity, and mortality. 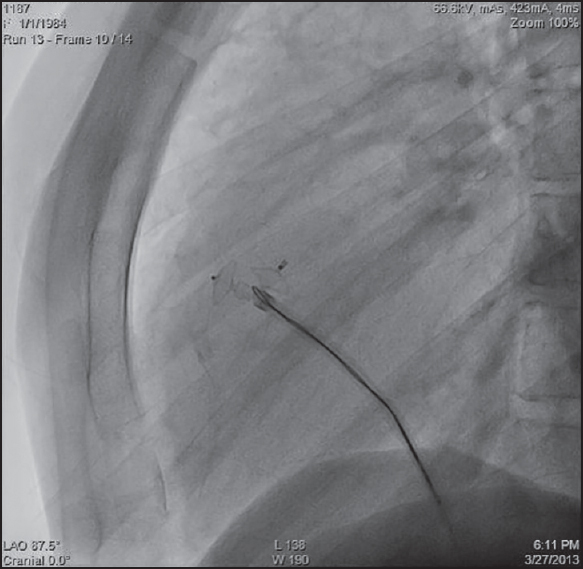 Right heart catheterization remains the gold standard test for diagnosis of PAH, but it is invasive and practically not feasible. Aims and objectives: The present study objective was to screen COPD patients for PAH using two-dimensional transthoracic Doppler echocardiography (ECHO) in Tertiary Care Hospital. Results: A total of 2040 patients with a confirmed diagnosis of COPD were enrolled in the study. Among these patients, 1509 were males (73.9%), 531 were females (23.06%), and 1428 were known or ex-smokers (70%). None of the females were smokers, but there was a history of biomass fuel exposure for >10 years. As per global initiative for chronic obstructive lung disease criteria, mild, moderate, severe, and very severe COPD was noted in 525,629,511, and 375 patients, respectively. When they were screened using ECHO, prevalence of PAH was 41.96% as 856 subjects had PAH. Prevalence of PAH among mild, moderate, severe, and very severe COPD was 23.8%, 34.81%, 48.53%, and 70.4%, respectively. There was a linear relationship between PAH and severity of COPD. Conclusion: PAH is very common in COPD patients in India. As the severity of COPD increased, the frequency and degree of PAH also increased. ECHO is an excellent tool for detection of PAH in COPD patients. All patients with severe to very severe COPD should be routinely screened by ECHO for PAH and with mild to moderate COPD, who have dyspnea out of proportion to their clinical condition should also be screened for PAH. The current study attempts to address an issue which is the need to obtain a preoperative electrocardiography (ECG) in all patients prior to non-cardiac surgery. Significance in patients without symptoms is uncertain. Aims: To study the incidence of ECG abnormalities in preoperative patients posted for elective non-cardiac surgery. 2. To study the co-relation of risk factors with ECG abnormalities. Materials and Methods: All hospitalized clinically stable patients advised ECG for preanesthetic assessment prior to elective non-cardiac surgery were included as subjects. Co-relation of risk factors with ECG abnormalities were studied. 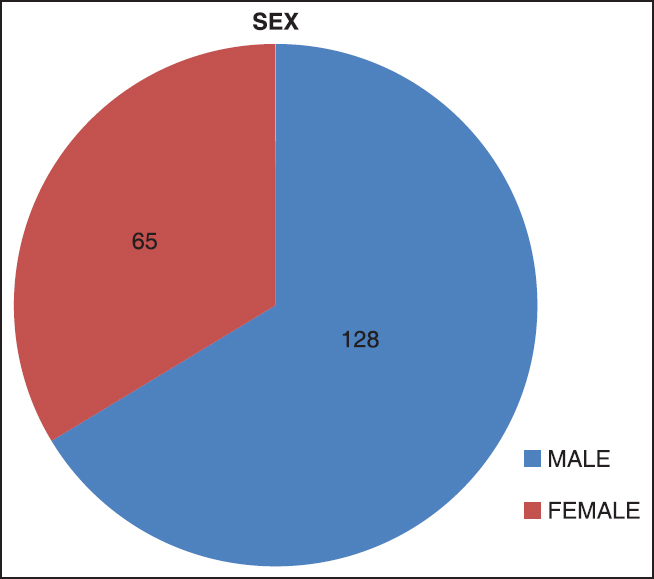 Statistical analysis used: Statistical Package for the Social Sciences (SPSS) software (chi-square test) Results: One hundred and twenty-eight males and 65 females were enrolled for study. Preoperative ECG was normal in 116 (60.10%) and abnormal in 77 (39.90%) patients. Abnormal ECG was more common in those with hypertension, diabetes, cardiovascular disease, and smoking. No adverse postoperative event was observed in any of the patient. Conclusions: ECG being a simple non-invasive tool should be considered for all patients undergoing elective procedures and should be mandatory for those with risk factors. Device closure of Ventricular septal defect (VSD) is gaining popularity as a preferred method of treatment in suitable patients. The decreased morbidity and mortality associated with the procedure as compared to open heart surgery is the main reason behind this. 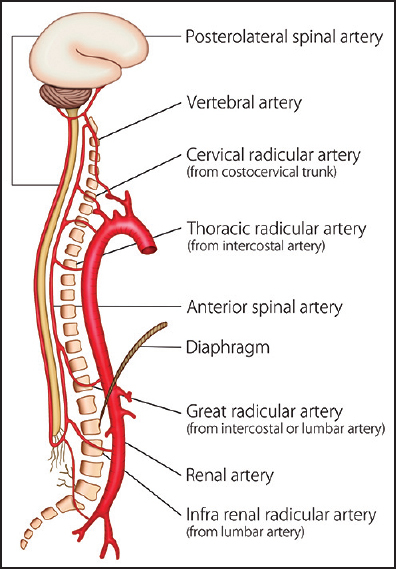 Device embolization is a dreaded complication that occurs rarely with this procedure. While surgical retrieval of the device is preferred at most centres, the device can be retrieved per cutaneously by employing suitable maneuvers. We are reporting a case where we successfully retrieved an embolized ADOII device in our patient. We intend to emphasize the need for thorough pre operative assessment of the patient before proceeding with device closure in order to prevent this complication from occurring. A 54-year-old Indian male patient was presented to our hospital with the complaints of chest pain since 1-day prior to admission. He was diagnosed, elsewhere, with anterior-wall myocardial infarction and was treated with tenecteplase. Subsequently, he was referred to us for the management of postinfarction angina. He was a known case of hypertension and had no family history of coronary artery disease. 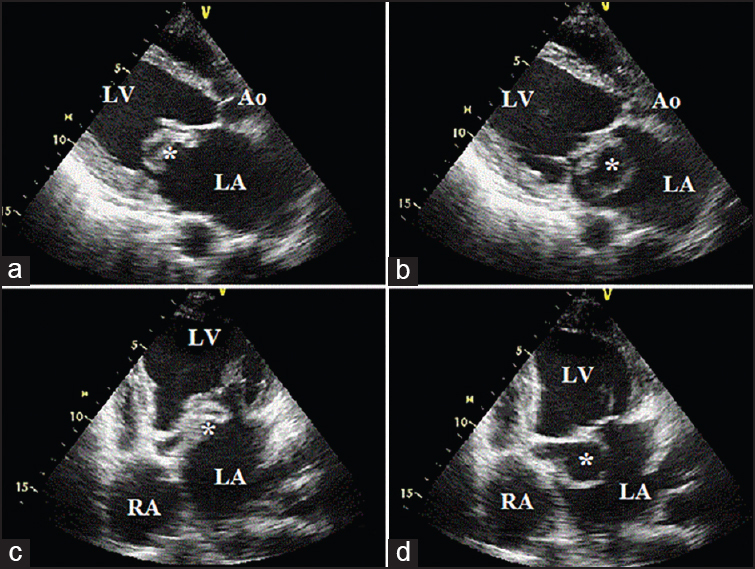 Echocardiogram demonstrated hypokinesia of anterolateral wall with normal left ventricular function. Angiography revealed a single vessel disease-99% stenosis in the mid-segment of left anterior descending (LAD) coronary artery with significant narrowing at the proximal site of diagonal 1 (D1) branch. 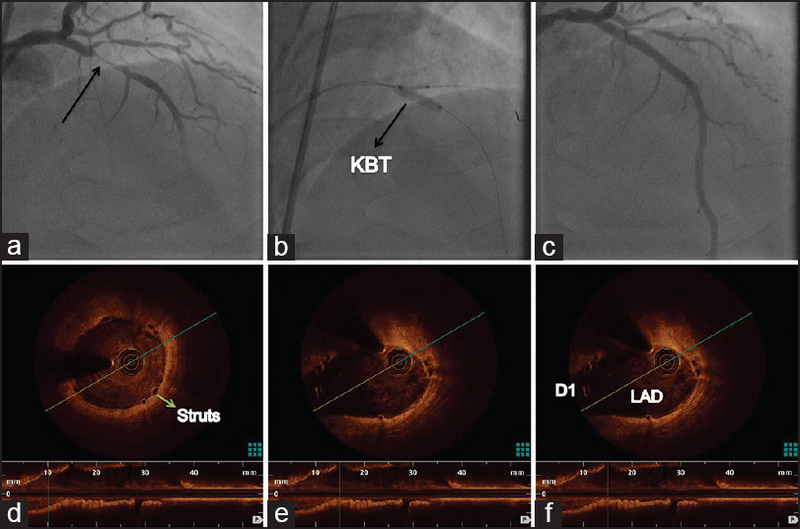 An optical coherence tomography-guided percutaneous coronary intervention to the LAD-D1 bifurcation lesion was performed successfully using ABSORB bioresorbable vascular scaffold (Abbott Vascular, USA) and kissing balloon angioplasty. No postprocedural complication was observed and the patient was discharged the next day. Clinical evaluation at 1-year follow-up was satisfactory. Cardiac metastasis lung malignancy can metastasise to heart. We herein present one such case. We report a case of 25-year-old female presenting to our department for evaluation of dyspnea on exertion. Two-dimensional transthoracic echocardiography showed a sac-like aneurysmal structure arising from the left ventricular outflow tract region protruding into left atrium. 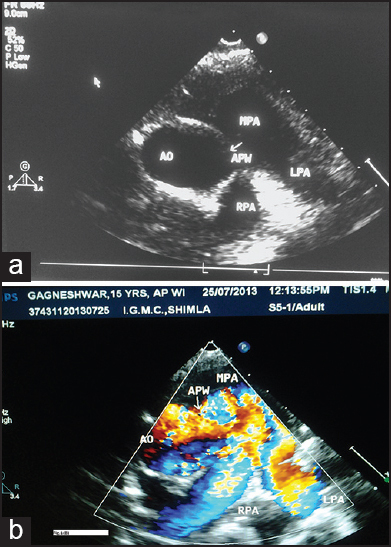 Three-dimensional transthoracic echocardiography clearly delineated the origin of the aneurysm from the region of mitral aortic intervalvular fibrosa, helping in confirmation of the diagnosis. Aortopulmonary window (APW) is an extremely rare cardiac malformation accounting for 0.2-0.6% of all congenital heart defects. In an acyanotic patient with clinical evidence of patent ductus arteriosus with large left to right shunts and systolic rather than continuous murmur one should keep in mind the possibility of APW. If not treated early in childhood or adolescence, they tend to develop pulmonary hypertension, which can be fatal in almost all cases. Few surviving adult patients have symptoms associated with severe pulmonary hypertension, making these cases inoperable. We document an unusual case presenting in the second decade.